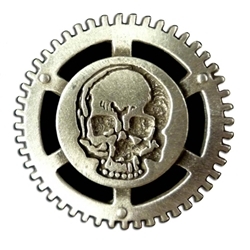 Our Steampunk Pirate Button is a gear button with the etching of a Victorian Skull in the center. Great for Pre-wreck salvagers. Cast in lead free pewter in the USA, This button measures 1.25 inches in diameter. Our buttons have a shank or loop on the back for you to sew them to your garment. It would be great for any sewing, knitting, or costuming project.